There is a saying in: Latin Semel in anno licet insanire. It means “madness is permissible once a year". In the church calendar, that once a year is today, Mardi Gras, Fat Tuesday, Martedì Grasso. Venice is the best known of carnival celebrations - people come from around the world to dress in exquisite costumes and to attend lavish masquerade balls. Though it is the most famous, it is far from the most interesting in Italy. Carnival is celebrated all over the peninsula. There are carnevale parties for children much as we would have Halloween celebrations here in the US – food, costumes and games. And in many small towns there are parades with ornate floats. Here are a few of the more interesting celebrations. This celebration starts innocently enough. The dedication of a tree, a procession in costume through town and a pipe and drum band. And then the fun begins. 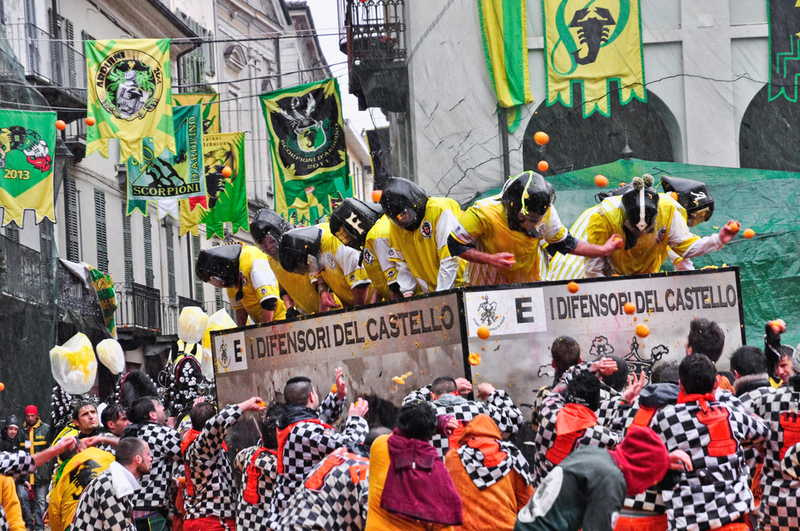 The Battaglia delle Arance, the battle of the oranges, in which nine teams on foot are pitted against teams on horse drawn carts as they throw oranges (400 tons of them to be exact) at each other in a reenactment of the people’s rebellion against tyranny. The parade then continues to the Town Hall and everyone eats fried cod with onions. Naturally. Ivrea is a small town in the region of Piedmont (yet another reason to visit). Another celebration with an ancient tradition dating back to the 14th century, the carnival in this town in Puglia lasts from the day after Christmas to Fat Tuesday with a variety of events taking place throughout the season. Concerts and masquerade balls take place every Thursday and then the famous processions take place on the last three Sundays of Carnival. The floats of Putignano are impressive – some standing up to 50 feet high. They take thousands of man hours to create and there is a great deal of pride in the process. Though the floats originally had a religious theme, today most are satirical in nature. During the processions, kiosks and vendors line the streets selling toys and food while musicians and street entertainers wander through town. Carnival comes to a close with a funeral procession and the burning of a paper mache sacrificial pig.